Beautifully Organised: How to keep your house tidy easily - even if you have kids! 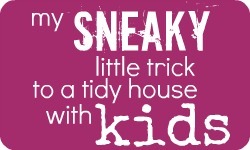 How to keep your house tidy easily - even if you have kids! So, how do YOU keep your house tidy? Share your tips and tricks below! striped box (lounge room) was a gift, so I don't know where from or the price, sorry! I love the bookshelf in Sophie's room - do you mind telling me where you got it? That was my favourite part too caz ;) And my bed hair! Thank you so much for the tip! I've just signed up and looking forward to more tips :) At the moment I use laundry baskets / tubs around the house to put toys in. Its worked well with just my daughter (as they were all her toys), but now that #2 is on the way I think I will need a more structured system and I like this one :) Thank you and I hope you feel better!